The Pletschacher Group based in Dasing, near Augsburg, Germany, builds almost all pavilions for the Munich Oktoberfest, and also supplies other folk festivals such as Cannstatter Wasen. In addition to building pavilions, Pletschacher is also involved in commercial, retail and office construction. The company has increased their storage area, and the new 16,500 sqm area in Dasing has room for 2,000 container loads of building materials. To transport the loads weighing up to 10 tonnes in and out of the four halls, powerful equipment is needed. 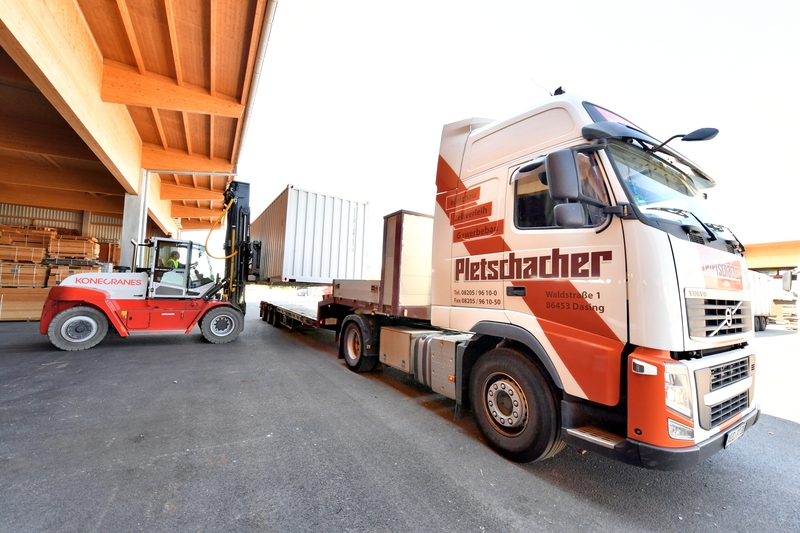 Planks, walls, decorative elements, and many other components of the pavilions must be transported quickly and securely, so that the large folk festivals supplied by Pletschacher can start well. In one of the four halls, a Konecranes crane will lift heavy, bulky loads, while outside, a Konecranes heavy-duty forklift will securely transport the containers to their destination, even in narrow environments. To accomodate the requests from Pletschacher, Konecranes designed a special heavy-duty lift truck and a double-girder bridge crane, which was offered along with a suitable service package. To be able to lift heavy loads in the narrow environments, the heavy-duty lift truck has been designed with a very short wheelbase. 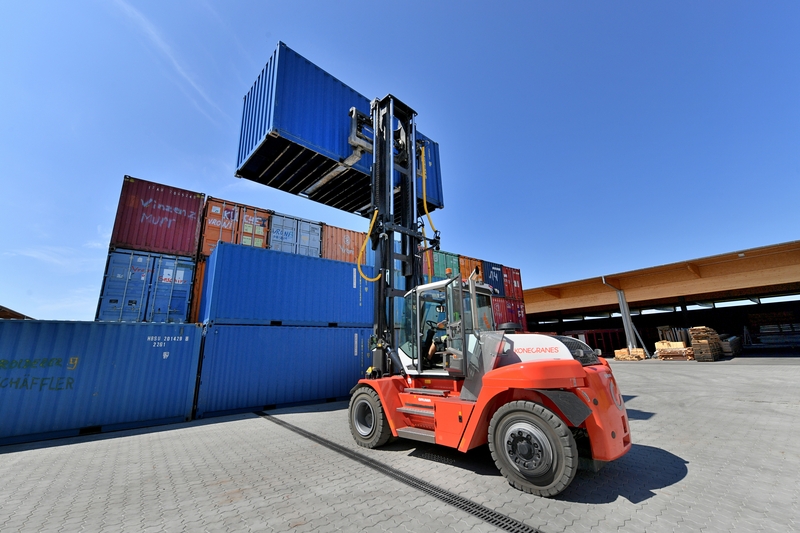 Konecranes supplied a SMV 10-1200 C forklift that lifts up to 10 tonnes and has a wheelbase of only 3 meters. A sensor issues an acoustic warning signal at a lifting height of 2.8 meters, so that the load can also be securely transported through low hall gates. The double-girder bridge crane has two hoists 3 meters from each other to ensure a secure transport. The hoists of the double-girder bridge crane spanning 18.5 meters lift up to 5 tonnes and can be easily operated via joystick – also in tandem for bulky components. Two CLX chain hoists complement the crane system. Thanks to the new equipment, Pletschacher is able to quickly and securely load the 44 trailer trucks that drive daily on the festival meadows. 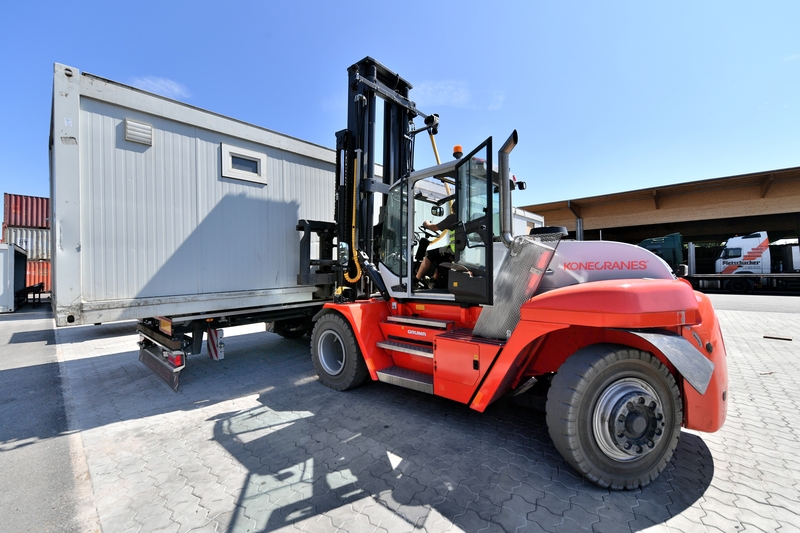 The ergonomic Optima cabin turns the heavy-duty lift truck into a comfortable workplace, while the crane is very flexible thanks to the continuously adjustable lifting and driving speed. A robust construction and a service concept consisting of accident prevention checks, inspections and preventive maintenance also optimize availability. "Prior to large folk festivals such as the Oktober- fest we’re always very busy in our warehouse, so everything must be reliable, secure, and fast. The double-girder bridge crane, the heavy-duty lift truck and the chain hoists from Konecranes are precisely the right solutions for our needs. They are very helpful for our team during the daily loading of building materials. And thanks to the comprehensive service we are able to rely on their service for the long term", says Ulrich Pletschacher, Managing Director at Pletschacher Group.